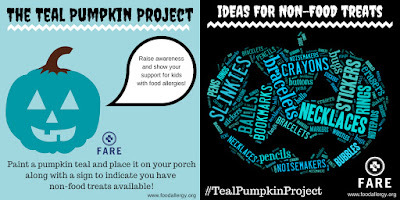 Launched in support of children with food allergies the Teal Pumpkin Project identifies homes that have non-food treats available for kids. 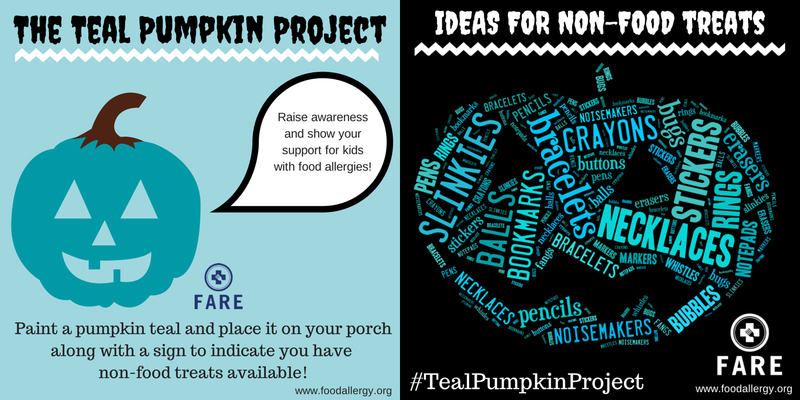 Though we haven't put out a teal pumpkin in the past, we've been providing non-food treats since 2006 (and we've yet to be egged). We started because it felt odd for us to be handing out candy and I was encouraged by a study that had reported kids on Halloween enjoyed getting toys as much as they did getting candy. Over the years we've handed out Play-Doh, stickers, temporary tattoos, coupons for free swims/skates at local community centres, and glow wands and swords (the biggest hits by far). Truthfully though, I'm not opposed to candy on Halloween. It's the other 364 days of the year we need to change.